Upon Mussolini's rescue from Italian arrest, Adolf Hitler ordered Mussolini to form a new fascist state or else he would destroy Milan, Genoa and Turin. Knowing the alternative would be undisguised occupation under a protector with Italy being treated like an occupied enemy, Mussolini obliged. The Italian Social Republic was proclaimed on September 23. 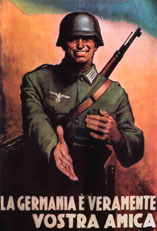 Although Mussolini desired to return to Rome, the Germans vetoed the idea due to the proximity of the city to Allied lines and the possibility of civil unrest if the Duce revealed himself. Instead, Mussolini established his capital in a villa at Salò on Lake Garda, midway between Milan and Venice. Immediately upon the state's creation, it became obvious that it was little more than a puppet state dependent entirely upon Berlin. 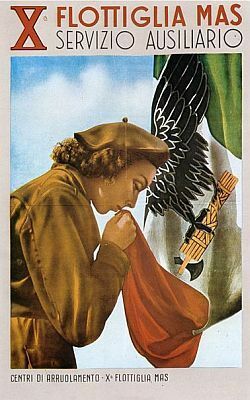 German distrust of the Italian Fascists' ability to control their own territory, as well as German territorial claims on Italy, which had been repressed from the 1930s for the sake of alliance with Italy, rose to the forefront. Germany forced Mussolini to cede Istria, Trieste, and Tyrol to Germany and Mussolini was told that he'd have to cede Venice next. Huge portions of Italian-populated territories, acquired through years of conflict, were suddenly forced to be abandoned. The Italian Social Republic (Repubblica Sociale Italiana) was created on September the 23rd, 1943 by Mussolini, when he had already lost control of most of Italy: it was located in northern Italy, still controlled by Germans, even if its borders were not clear because of the war, and it's often names as "Republic of Salò" because the Ministry of the Interior was in the town of Salò (click here to see the map). It lasted about one year: the Allied troops invaded it in the first months of 1945 and Mussolini was shot on April the 28th, 1945... that was the end of the Italian Socialist Republic.